Short Description:Solve your air-con troubles! 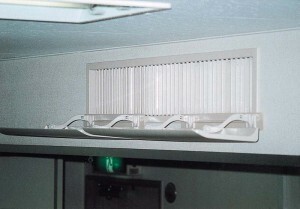 Air conditioner air baffle,air wing ,or wind baffle,air guide for A/C indoor unit,is an innovative design that utilize a plastic deflector panel installed at the vent of air conditioner to change,guide or control airflow, air direction,and thus to let cold(warm) air well-distributed in the room evenly,therefore guide air way to distribute cooling air or heating air more peacefully, circulating comfortable air breeze to every corner in the building,in room,in hotel,in dining room,in hospital or in theatre,to eliminates nuisance air,and thus avoid direct air to breeze onto someone. After install air baffle ,you even can save electricity consumption about 10%. 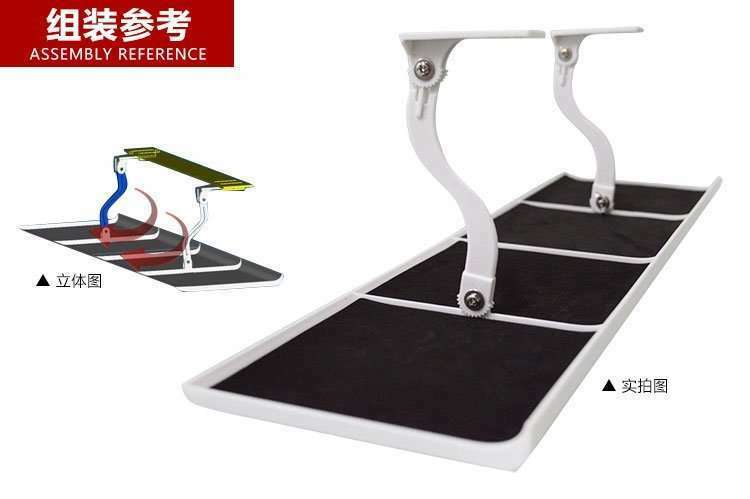 The air wing is made from Plastic ABS and with insulation layer to prevent condensation water.As air conditioner maintenance accessory,it is easy and quick installation,nice-looking.It can be used on ceiling air conditioner,split wall mounted air conditioner and ground standing air condition. -It is a smart design product to improve air conditioner room comfort. 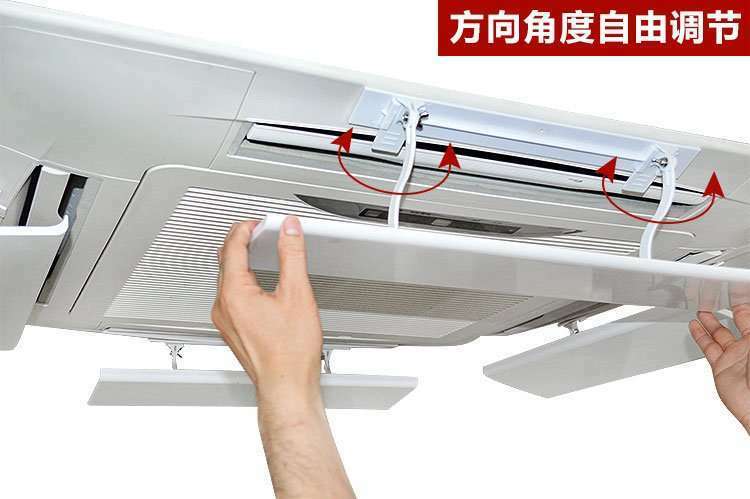 Freely adjust air direction way,up and down air direction 180 degrees,for cold air and warm air,any season. 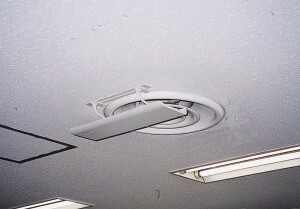 -Adjustable air way to distribute cooling air or heating air more evenly,avoid direct air to breeze onto someone. -S-shaped design to let air flow more peacefully. -Supports ductless air conditioner and duct air conditioner,various home or commercial air conditioning. -Insulation layer as Condensation prevention mat on the deflector to prevent condensation water. 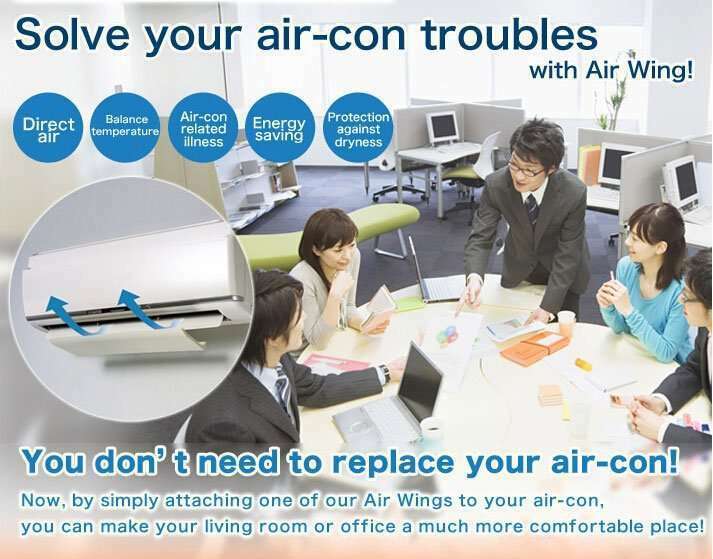 – Eliminating rigid jets of uncomfortable air. -Has three models,long 52cm,73cm and 93cm. 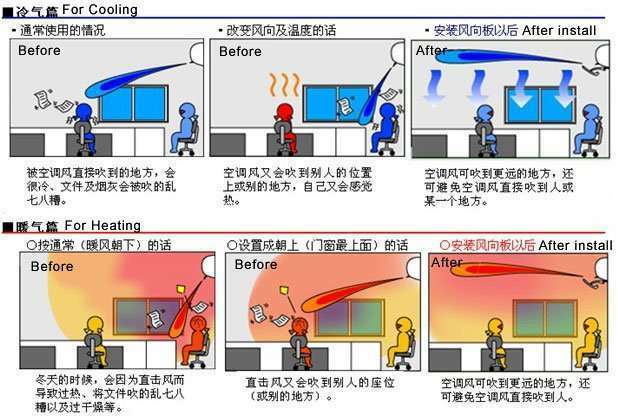 Air deflector even out indoor temperature by against direct air to blow person,which let you feel uncomfortable. 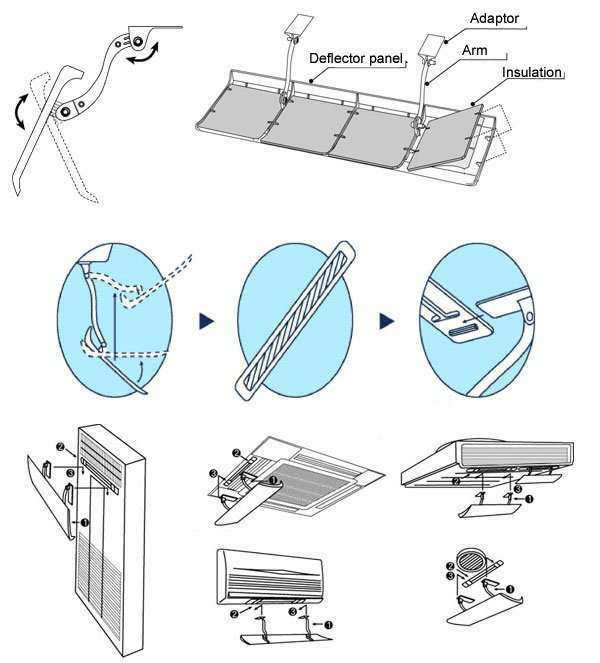 The deflector fits all air conditioners and it can be installed instantly with adhesive tapes & adapters. Non-invasive. 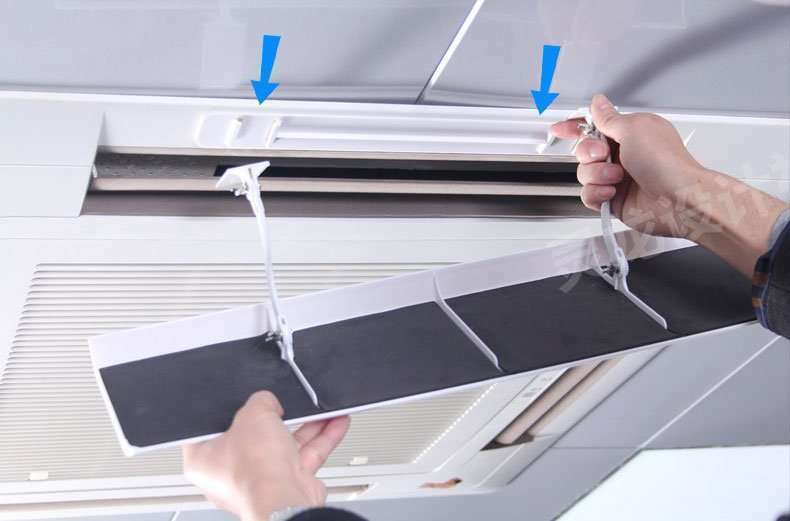 By controling air blows with Air baffle(deflector), it improves efficiency of you air conditioner for 2 degrees F – you can set your air conditioner 2 degrees F higher in hot summer & 2 degrees F lower in cold winter. This can reduce your annual electricity bill by $940 (*1). 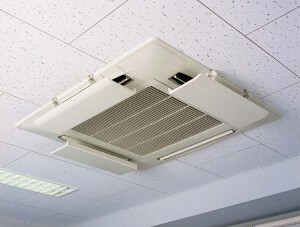 Tradition air conditioner always blow its cold air directly onto face,and thus let people have health problem,we name it “air conditioner disease”.How to overcome “air conditioner disease” when you are enjoying comfort air in A/C room? Simple,just use Air Baffle,Air wing For Air Conditioner-it can be for all our air conditioner indoor unit,Change air way to let cold(warm) diffuse in the room evenly. Indoor air is generally divided into three layers, which are “ground thermostat layer, the middle mixed layer and the upper layer of heat accumulating . 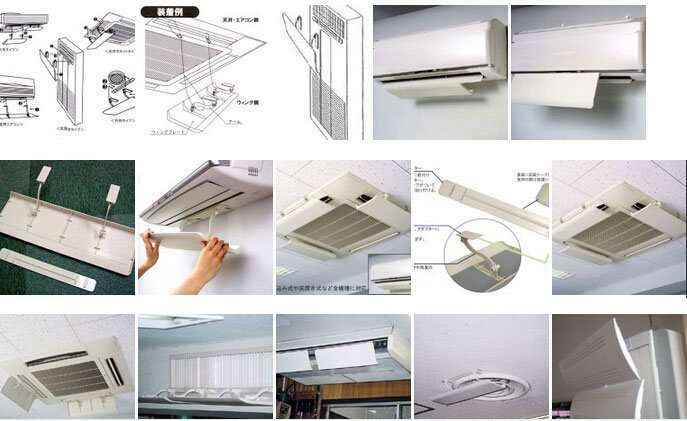 The installation position of air conditioner indoor unit is generally in upper layer of heat accumulating . 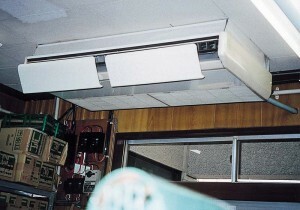 Due to the physics principle of cold air is strong but heat air is weak,the cooling air from indoor unit is directly down to the ground thermostat layer through the middle mixed layer of the heating and cooling .Therefore, the air at the lower layer is cooled rapidly, the cooling air is accumlated from the below to up,to let human feeling cool.Air wing slim evens out room temperature by taking full control of your air conditioning against to uncomfortable direct air blowing. But the cooling for the upper layer depends on the radiation of cooling air from below layer. The radiation is no good effect because there is no rapid exchange between upper layer and ground layer.Also,because of the continued invasion from the outdoor heat , resulting in the slow temperature drops in the upper layer. Therefore, the air conditioning is switched on for a long time cooling state, even if the indoor air temperature is already low. 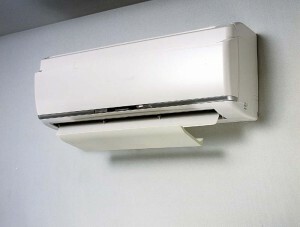 This is the present situation of the existing split wall-mounted air conditioning running. 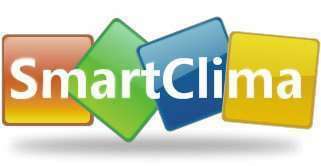 The air baffle for air conditioner made by Smartclima overcome the above phenomenon through to install an air-way panel at the outlet of the indoor unit, to change/adjust the angle of outlet cooling air. of the air guiding cover. 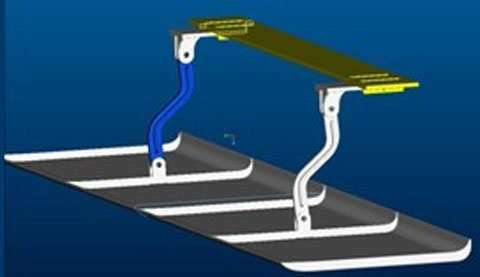 Because of the use of air baffle,the cooling air will not be directly blown onto the body. Through the living hinge of the wind guide panel to adjust the orientation of the air stream, in order to adapt to different needs; At the same time, since the cold air is guided to upwardly, so that cold air is first blown to the upper layer of heat accumulating, firstly to mix the upper heat air,and then the mixed air is recycle from the top to down,which way is following the priciple of the exchange between heat and cold,by the above way,it improve the overall cooling efficiency of the indoor air. 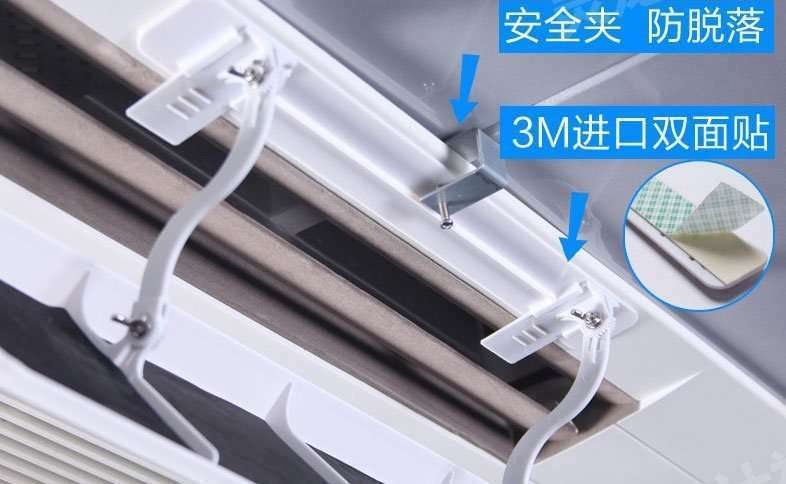 The refrigeration cycle mode mentioned can make the room air at up and below keeps very small temperature difference, therefore it can reach air conditioning seted temperature in fast, to shorten the running time of the air conditioner able to achieve energy saving. After several tests, compared the test result of the air conditioning seted temperature from 22 to 26 ,we know it can save energy about 10% after using air baffle. Test environment: 20 square meters bedroom, 12000BTU wall-mounted air conditioning (power 1.2 kW), the outdoor maximum temperature of 34 , minimum temperature 22 (outdoor temperature from the day weather forecast) test time 24 hours, start testing time 10:00 start testing the indoor temperature is 29 ; air conditioning seted temperature of 25 , automatic swing wind. Test results: air-conditioned first downtime 11:32, total power consumption of 18500W..
Test environment: 20 square meters bedroom, 12000BTU wall-mounted air conditioning (power of 1.2 kW), the date of the outdoor maximum temperature of 34 minimum temperature 24 , 24 hours of test time, starting test time 10:00, start testing indoor temperature 29 ; air conditioning set temperature of 25 , automatic pendulum Wind. Test results: air-conditioned first downtime 11:10, total power consumption of 16500W. After use air baffle ,can save electricity (18500-16500)/18500 = 10.8% ! 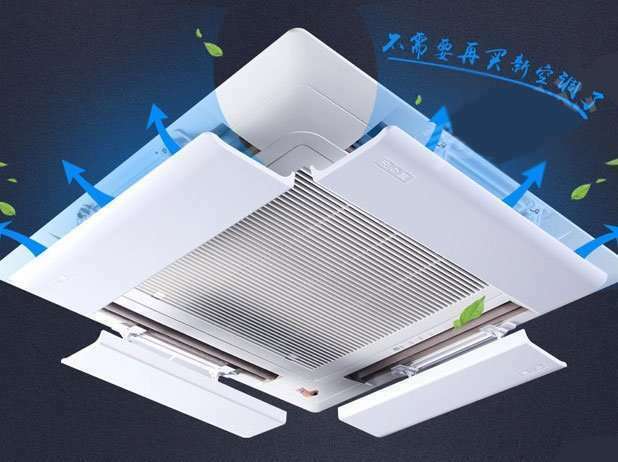 Description: The air-conditioning seted to 25 as example, because it is the best temperature for human feeling and energy-saving effect of contrast. Hi ! I am interested in the product . Please let me know about pricing , and how can i get the product. 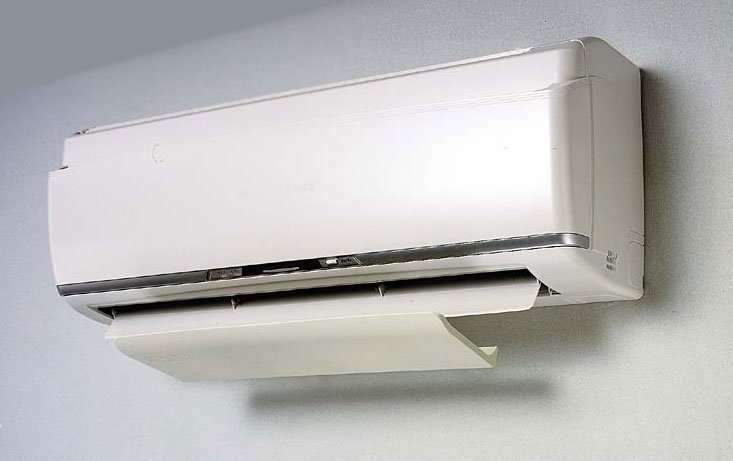 I runs a small hotel.There are 60 rooms seperately,and every rooms is installed with wall mounted duct air conditioner.Always,the clients complained that the cold air from air conditioning directly breezing onto him,which cause unconfort. 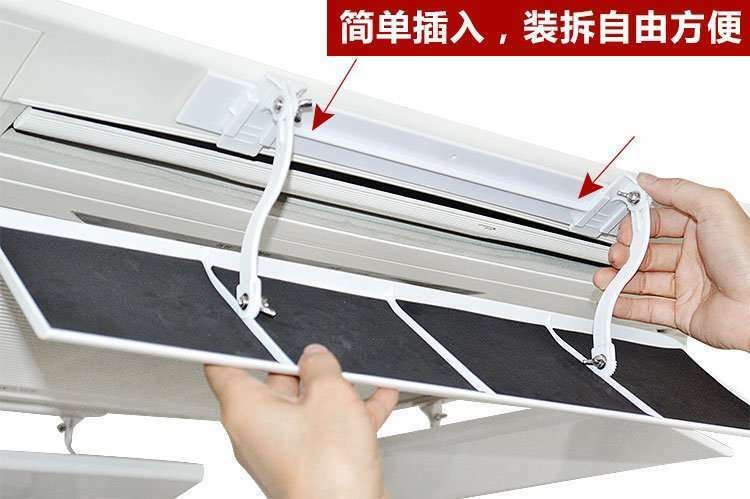 I`m surprised to the complaint because client is always right.Then,I purchased one air deflector from this website to try the effect.After get it,quickly install it onto the air conditioner,it`s very easy,I finish it within 5 minutes.Then I stay in front of the air outlet to feel temperature change.Really,the cold air doesn`t blow onto me direcly.I feel it is cooling the whole room evenly and peacefully…It let me feel very confortable…Finally,I decide to buy 59units for all rooms. Thank you! Thank you for your message.It`s very nice to know you are feeling good to our air deflector. I saw about air baffle for air conditioner smartclima, and I interested to buy it. What price of 53, 73 and 93 cm lenght? and how can I buy it?Thank you. I am from India and I am interested in buying this product. Could you please let me know how do we get this product in India? 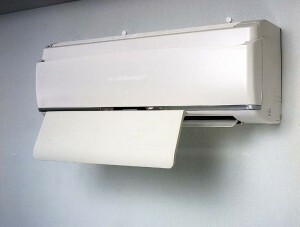 Where can I buy an “Air Baffle For Air Conditioner,Air deflector”. Dear Sir,We are currently using AC units PN 100714713D A/C, INDOOR, 24000BTU, 220V, 1Ph, but the air coming out the AC units is blowing into the face of the engineer we would like to install a deflector. Could you check you may provide a deflector with the same AC ? We need quantity 2 per unit and 1050mm in length.